There's a charm unique to Cambodia that can't be felt in other places of the world. Still considered one of the poorest nations, this country is rich in agricultural heritage and ancient world traditions. And while getting there from the West may seem like a big travel hurdle for first-time visitors, planning your trip carefully will send you on your way prepared. Secure necessary visas and immunizations and gain a grasp of how to navigate the country before you leave. Visitors to Cambodia must present a valid passport with an expiration of at least six months after their visit, along with a Cambodian visa. To obtain a visa, contact the Cambodian embassy in the U.S. Then, mail in a completed visa application form, a 2-inch by 2-inch recent photograph, and 35 U.S. dollars. 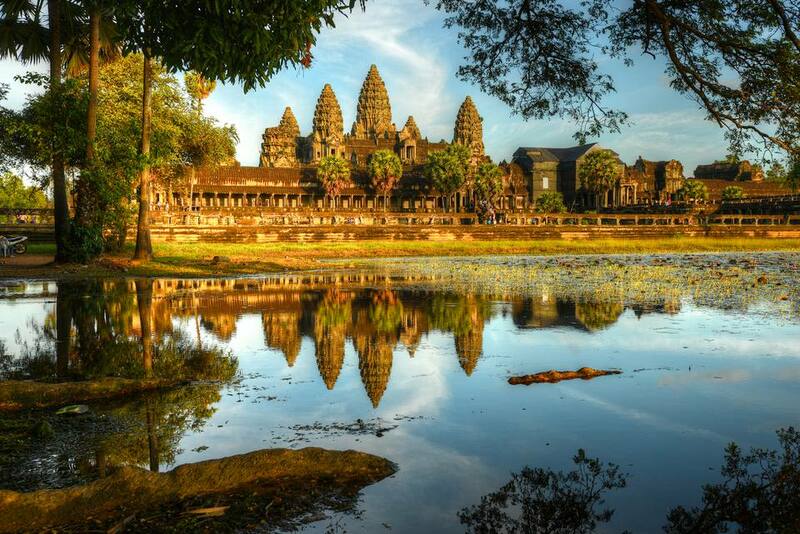 You can also apply for a Cambodian e-visa online. Just complete the online application form and pay with your credit card. Once you receive your visa via email, print it out and carry the printout with you to Cambodia. The validity of your visa extends 30 days from the date of issue, not from the date of entry. But those anticipating an extended stay can apply for a multiple-entry visa with a validity of up to three years. Should you encounter a mishap or want to extend your stay, apply for a visa extension through either a travel agency or directly at the immigration office in Cambodia. A 30-day extension costs 40 U.S. dollars. Or, if you're near a border crossing, you can also do a visa run to a neighboring country and then come back in. Overstaying tourists will be fined six dollars per day for expired visas. Take all necessary health precautions (arrange a checkup, secure prescription medicine, and receive immunizations) before you fly to Cambodia. Quality hospital facilities are rare and the pharmacies are limited in this country. Any major health issues will need to be addressed outside of the country, with the closest quality medical care being in the city of Bangkok. Specific immunizations are not required for entry. Still, a malaria vaccine is highly recommended for travel into Cambodia. Malaria-ridden mosquitoes are prevalent in the Cambodian countryside, especially during the rainy season. So, in addition to the immunization, you may want to pack bug repellent and a bug net to use at night. Also, long-sleeve shirts and long pants are the recommended after-dark attire. Other diseases like cholera and typhoid fever also exist in Cambodia. To be entirely safe, you may want to consider getting these vaccinations, as well as updating your tetanus, hepatitis, and polio shots. Visitors 18 years and older are permitted to bring 200 cigarettes (or an equivalent quantity of tobacco), one opened bottle of liquor, and perfume for personal use into Cambodia. All currency must be declared upon arrival. And visitors are prohibited from carrying antiques or Buddhist reliquaries out of the country. Souvenir stand purchases, like Buddhist statues and trinkets, can be taken home, however. Cambodia’s official currency is the riel, found in denominations of 100, 200, 500, 1000, 2000, 5000, 10000, 50000, and 100000 notes. U.S. dollars are also widely accepted in major towns and cities. Traveler's checks and cash should be used above all else, as credit cards are sporadically accepted. Street crime is a risk in Phnom Penh, especially at nighttime and even in popular tourist nightspots. Bag-snatching is also a risk in urban areas and is usually pulled off by enterprising young men on motorcycles. To prevent this, keep what you carry to a minimum and secure wallets and purses underneath your clothing. Cambodia is still one of the most heavily land-mined countries in the world, but this shouldn't concern you unless you venture near the Vietnam border. Traveling with a local guide and staying on marked paths will assure your safety. Many tour agencies in Siem Reap profit from bringing tourists to orphanages to watch orphan apsara dances or to provide volunteers to teach English. Do not patronize orphanage tourism. This racket actually does more harm than good by taking advantage of disparity for the sake of making a buck. Sturdy shoes (for walking) and proper waterproof rain attire are highly recommended for travel to Cambodia. While the typical rainy season lies between May and October (and can make overland travel impossible due to floods), showers can pop up at any point. Light cotton or breathable clothing is also recommended in this tropical climate. And both sexes are advised to wear modest clothing when visiting religious sites like the Angkor temples.